With the ever-increasing concerns of rising oil prices and impending climate change, nations across the globe are seeking cleaner ways to produce energy. Renewable sources have suddenly been placed at the forefront of this process, namely wind energy. The development of wind energy has become perhaps the fastest growing in the field of renewables. It has several advantages, namely the fact that it is a “clean” energy source. Wind power is quiet and efficient, or so it would seem. Rarely, however, are the potential drawbacks of wind energy discussed, namely the impacts it has on local residents. It is important to keep in mind that the process of generating energy from wind turbines is not without its flaws, and there will certainly be those who have their objections to it. Rarely does one who has no contact with wind turbines come to consider the sound of the “whoosh” that the blades make. However, this sound has caused, and lead to, a number of problems for those who must interact with these metal giants on a daily basis. But to what extent does this noise impact those nearby? Statistics show that the noise level of a wind farm from 350 meters away is very similar to that of a quiet bedroom, or a car traveling at 40 miles per hour, heard from 100 meters away [vi.]. Studies have also shown that said level is lower than that of a business office on any given workday [vii.]. Therefore, one would not figure that the noise from wind turbines should have that much of an effect on nearby residents. In fact, The British Wind Energy Association states that wind farm noise should not be noticeable in most residential areas. However, the location of most wind farms tends to be in rural, relatively serene areasthis may lead to the complaints of excess noise [vi.]. It must be put into perspective; if a wind farm was located near a major metropolis, the noise from the turbines would not be as easily heard. In this case, though, the turbines are located in quiet countryside, where any added noise would be more easily noticed. The greater the distance of turbines from residences, logically, the less likely turbine noise would be audible. Helimax Energy, in its study of wind energy in British Columbia, arrived at the conclusion that turbines further than a distance of 400 meters from homes would not (generally) be capable of being heard [xii.]. What of a corporate response to the noise issue? In most cases, corporate management teams try to portray their projects as being environmentally beneficial with no adverse side effects. However, local residents know this not to be the case. There are always drawbacks, whether noise-related, aesthetic, or otherwise. In one rare example, though, John Zimmerman, an executive of Enxco, Inc., has acknowledged otherwise. His company is currently looking into wind farm development in Massachusetts, and he has stated that “wind turbines don’t make good neighbors” [xi.]. This takes into account the fact that wind turbines often decrease property values, are an aesthetic nuisance, and raise transportation concerns. To look at it from an environmental health perspective (as well as in a rather grim light), “Wind Turbine Syndrome” can have adverse effects on those who live near turbines. The technical term is Vibro-Acoustic Disease (VAD), and research has been ongoing on this issue for nearly three decades [i.]. VAD can be caused by overexposure to low frequency noise, a common byproduct of wind turbines. This disease, while recognized by the Portuguese government, is still relatively rare and in its research stages [i.]. Thus, it would not be fair to attribute this as a major problem associated with wind turbines and wind farms. Looking at this issue from a more positive light is Luisa Colasimone, communications director for the European Wind Energy Association. She asserts that noise was once an issue with turbines, but consistently improving technology is reducing the impacts of noise. The size of the blades, the location of the turbines, and the strategic placement of the turbines in relation to the wind all have a profound effect on how much noise is emitted from each turbine [v.]. There is clearly conflict with this issue among experts; residents who live near wind farms are certainly no different. Firsthand accounts of wind turbine-associated noise vary greatly. While there are those who will immediately discount any noise problems wind turbines may create, there are certainly an equal amount of others who strongly disagree. Jerome a Paris is one such individual from the former group. He deals with the financing of wind farms, and thus is familiar with the impacts that turbines can have on a community. He asserts that although older turbines may have had an issue with noise, new technology has fixed that problem. Mr. a Paris claims that he has personally stood underneath turbines and could “barely hear a hum” [ii.]. Much of the opposition to wind turbines and wind farms deals with the “not in my backyard” principle. It would seem that people are generally receptive to wind energy, so long as turbines are not constructed in close proximity to their place of residence. Such is the case with Kittitas County, Washington. Two different energy development corporations have plans to install over 150 turbines in this rural, scenic area. They have been met with strong opposition, such as from 72 year old resident Sandy Sandall. He generates his own electricity from renewable sources, and has nothing against alternative energy sources. But he has taken into account, especially, the sound of the blades turning in the wind. According to him, this sound is comparable to a “whoosh” that can be heard from a good distance away. He has stated that “this is just not the place” for a wind farm[iii.]. Taking this same situation into account, but looking at it from a different viewpoint, we see that not everyone in Kittitas County is opposed to the wind farm plan. Resident Mike Genson, who owns property adjacent to Sandall’s house, is very much in favor of the project and the opportunities it will bring about. Genson said that he visited another wind farm in Washington state and that the looks or sounds of it didn’t bother him [iii.]. Human subjectivity must be taken into account when considering the noise impacts of wind farms. For example, although Mr. Genson of Washington had no objections to a wind farm on noise-related grounds, Julian and Jane Davis of the U.K. certainly do. They live slightly over 2,500 feet away from a small wind farm (only eight turbines). However, they have noticed the aforementioned “whooshing” sound as well. Mr. Davis attributes this sound to “amplitude modulation,” an effect that can sustain this sound. To further clarify, Mr. Davis has stated that the sound is comparable to an oncoming train “that never arrives” [x.]. However it is examined, personal feelings and opinions will come into play; the American Wind Energy Association states that “the degree to which a noise is bothersome…is largely in the ear of the hearer” [iv.]. Is turbine-associated noise an issue? It would seem that one would have to ask those who live in close proximity to wind farms to find an answer. Although the Davis example might be the strongest case to prove that noise IS an issue (they have had to spend over 60 nights away from home in one year alone, simply to escape the noise), one can find an equal number of personal accounts that deny the presence of unwanted noise. One thing is for sure, though; the opinions of residents weigh heavy on the decision of whether or not to construct new wind farms. With all this discussion on the noise-related problems associated with wind power, or perceptions thereof, what can be done to “solve” them? Clearly, new technology would offer up the best possible solution. However, said technology is still not available in a widespread capacity. There is one company in particular, though, that has developed a new “style” of wind turbine. The “Quiet Revolution” turbine out of Great Britain has been turning heads as well as its blades with its innovative new design. Instead of the typical three-blade turbine, the Quiet Revolution is shaped in a helix form, reminiscent of the familiar images of DNA. The company that manufactures these turbines claims that the eccentric “S” shaped blades enable it to mostly eradicate all noise related to the turning of the blades [ix.]. However, will these new turbines be the wave of the future? While that remains yet to be seen, there are a number of measures that can be taken in the present to reduce wind turbine noise as much as possible. The most obvious example (and, as evidenced above, not necessarily always the most doable one) would be to locate turbines and their generators in as remote a location as possible. However, sometimes the close proximity of residences and towns make this task next to impossible. Another suggestion seems rather simple as well: research the existing “background” noise levels for the area intended for wind turbine construction. Following this step, measurements of noise levels for the turbine itself should be recorded. Then the question must be asked: how do these two noise levels compare? If the “normal” existing background noise is projected to be greater than that of the turbine, then noise should not necessarily become a mitigating factor in construction of said turbine(s) [viii.]. All things considered, though, the subjectivity of human opinion will always have a heavy role in such decisions. As seen through numerous examples, the issue of noise problems associated with wind turbines is often not an issue at all. Which begs the question: are the drawbacks of turbine noise enough to hold up the implementation of these renewable giants across the landscape? This is a question that must be answered individually, but if made collectively, could have a significant impact on the energy policies of nations worldwide. [i.] Alves-Pereira, Mariana. (VAD). <http://www.windaction.org.> 31 May 2007. [ii.] a Paris, Jerome. Alternative Energies: Wind Power. <http://www.dailykos.com/storyonly/2006/5/13/8838/11631.> 13 May 2006. [iii.] Cornwall, Warren. An Ugly Battle Over Clean Power. Seattle Times Newspaper. [iv.] Facts About Wind Energy and Noise. 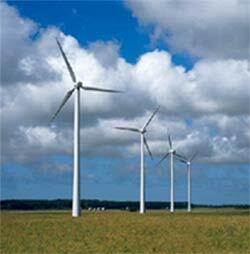 Wind Energy Fact SheetAmerican Wind Energy Association. [v.] Going With the Wind: Luisa Colasimone, wind power advocate, answers readers’ questions. Grist Magazine. 10 Sep. 2004. [vi.] Noise from Wind Turbines: The Facts. The British Wind Energy Association. [vii.] Permitting of Wind Energy Facilities: A Handbook, Revised 2002. National Wind Coordinating Committee. [viii.] Potential Impacts of Wind Energy Development and Analysis of Mitigation Measures: Executive Summary. [x.] Tasker, Johann. ‘Wind Farm Noise is Driving Us Out of Our House.’ Farmers Weekly. 12 January 2002. [xi.] Tillinghast, Eleanor. ‘Wind Turbines Don’t Make Good Neighbors.’ Green Berkshires, Inc. 14 May 2004. [xii.] Wind Energy Study in British Columbia: Final ReportSummer 2002. Helimax Energy, Inc.